WHO wore what: A view of the scene at DIOR‘s spring 2019 show in Paris yesterday. With so many double-takes of VIPs including Blake Lively sporting Maria Grazia Chiurri’s DIOR to the show, we had to take another look. Here’s the decked out mood of the guests – and a cute look backstage with designer photo op with the smiles and all! 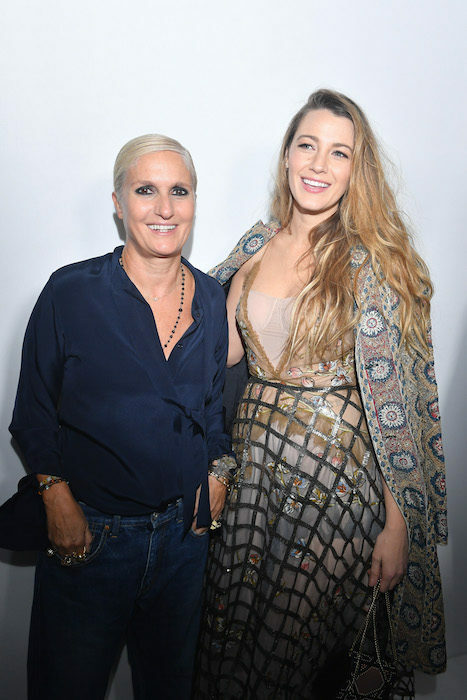 Shailene Woodley joined Blake, Olivia Cooke, HAIM, Melissa Benoist, Eva Herzigova, Dree Hemingway, Camille Rowe, Olivia Palermo, Chiara Ferragni, Aimee Song and Camila Coelho were just a few of the guests. Here’s a lowdown on their individual looks! Blake Lively wore a Dior Fall-Winter 2018 mulitcolored embroidered tulle dress, printed and embroidered beige cotton coat, Pre-Fall 2018 metallic caged skirt and a green trench coat. She also wore a Dior Cruise 2019 bag. Shailene Woodley wore a Dior Cruise 2019 gray knit skirt with Fall-Winter 2018 printed t-shirt. She also wore a Dior wool hat, black leather “Saddle” belt, black Dior “Amour” pumps, and a “Toile de Jouy” “Saddle” bag. Este Haim wore a Dior black tulle skirt with black cotton turtleneck. She also wore Dior Cruise 2018 boots, a Dior mulitcolor beaded “Saddle” bag, and Pre-Fall 2018 Dior “Power” sunglasses. 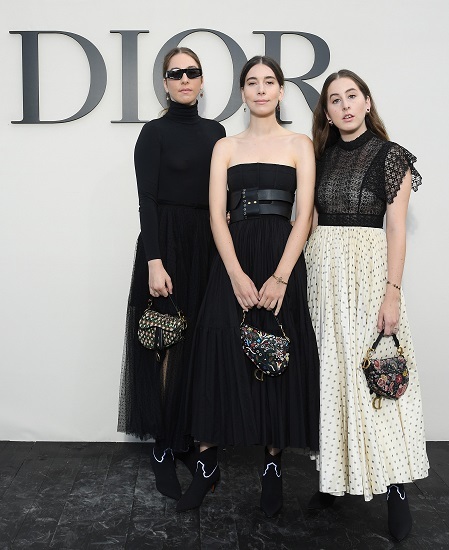 Danielle Haim wore a Dior Cruise 2019 black tulle dress with black leather “Saddle” belt. She also wore Dior Cruise 2018 boots and a mulitcolor embroidered “Saddle” bag. Eva Herzigova wore a Dior Cruise 2019 black lace dress. She also wore a Dior black leather “Saddle” belt and black suede boots. Dree Hemingway wore a Dior Cruise 2019 gray wool sweater. She also wore a Dior white tulle skirt, navy oblique “Saddle” belt pouch, and “WalkN” Dior sneakers. Camille Rowe wore a Dior Cruise 2019 black leather jacket and silk dress. She also wore an embroidered “J’adior” bag and suede boots. Camila Coelho wore a Dior Cruise 2019 white lace long dress. She also wore a Dior black leather “Saddle” belt, burgundy oblique “Saddle” bag, and a Dior necklace and earrings.